Once you’ve uploaded your products, you’ve organized them in categories and you’ve added the desired pages, you can customize the look and feel of your store. You can do this by accessing the Designer menu on your Soldigo dashboard. Accessing the tool will automatically place you in Design Mode. On the right panel you can access the actual Designer. You will find three tabs: Themes, Customize, Settings. Below the tabs you can set the store viewing mode in different devices like: desktop computers, tablets and smartphones. At the registration you already chose a theme, but if you wish you can change it. Simply search for the desired theme and click on the thumbnail image. 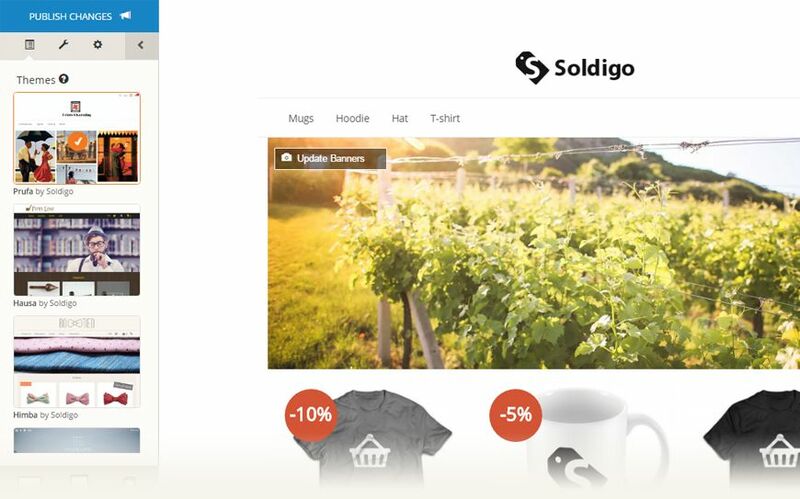 Based on the chosen theme you can set your store’s content colors and the font of the content. You can upload your logo or use a text logo which you customize as well. If you wish to change the background of your store you can choose a color or you can upload a background image or choose from a list of already uploaded images. Banners helps you notify you buyers about a release of a new product, about an offer or about a discount. You can upload as many banners as you wish or you can choose from a list of already uploaded banners. You can add for each of them a link where you store’s visitor will be redirected when they click the banner. If you don’t like the changes that you made to your theme you can easilly reset by clicking the Reset theme link. On the setting tab of your Designer you can add a decoration for your store. Using these decorations you can beautify your store for every occasion like Christmas, Halloween, Black Friday, Valentines Day etc. To add the decoration simply click on the image. You can set the homepage of your store. This can be your products list or one of your pages. 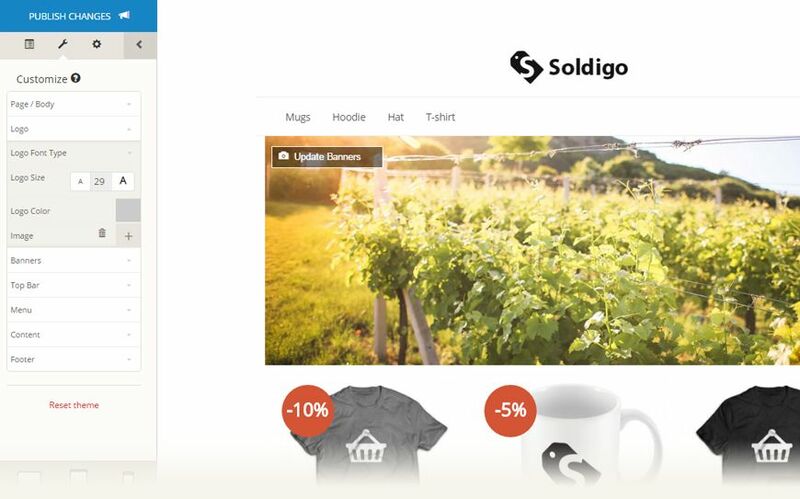 You have the option to hide elements like search box, related products or Soldigo badge from your store. In order for your customization to take effect, don’t forget to click the PUBLISH CHANGES button when you finished.